Have you ever wondered what heaven looks like? In this week’s 123RF World Travel Guide series, we kick start our trip by grooving to the smooth reggae tunes in Kingston’s Uptown district. Next, we experience heaven in real life in the ethereal Okunion. Following that, we feast our eyes and lenses to the extraordinary wildebeest migration in the epic Masai Mara. Finally, we allow our senses to follow the spice perfumed alleys of the Souq Al – Mubarakiya. 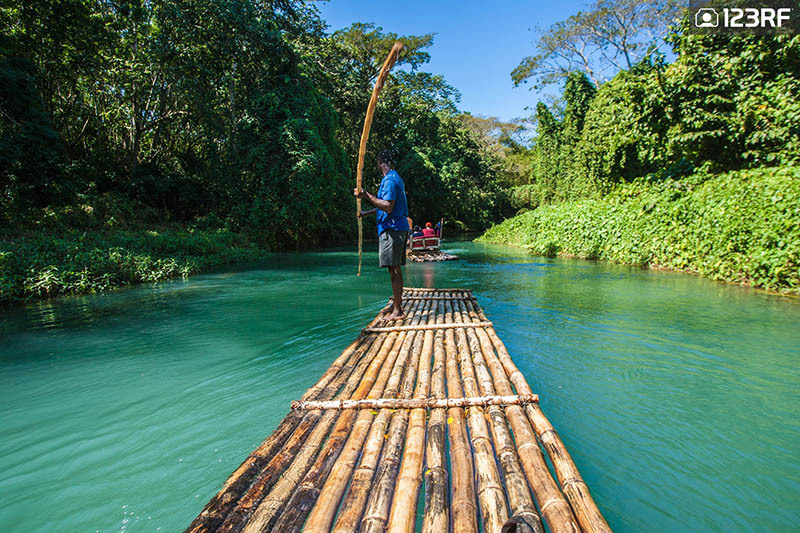 Be sure to experience one of these traditional bamboo rafts in Jamaica. For the 123RF World Travel Guide, Jamaica is intoxicating. Here, tease your ears as you groove to the reggae beats. Lend your eyes to spectacular cascading waterfalls. Taste every bite of tropical fruit and wash them down with good old rum. Finally, open your arms and welcome the gentle sea breeze on your delicate, tanned skin. In Jamaica, begin your journey by exploring the lush Blue Lagoon. Surrounded by serene forests, the turquoise waters are like a vision of beauty. A dip here enables travelers to get the best of both worlds – the warmth of the sea and cooling effects of the underground streams. For those keen for a dose for the high life, hike up the Blue Mountain Peak. For the best experience, make it just in time for sunrise. Jamaica also does not hold back on its Caribbean flair. A trip to Kingston allows travelers to experience the city’s history and culture in the downtown district. Meanwhile, head uptown for Kingston’s swanky food, dining and clubbing scene. Finally, no trip to Jamaica is complete without a trip to a local beach. And Doctor’s Cave is the best of the bunch. The stunning Fushimi Inari – taisha Shrine in Kyoto. Image via Sean Pavone@123RF. For the 123RF World Travel Guide, Japan is timeless. Ancient culture and traditions meet the cycle of a modern day life. Kyoto undoubtedly offers the best of both worlds. Japan’s spiritual heart is home to over 2000 temples, beautifully weaved and held together by the finest religious architecture ever seen. 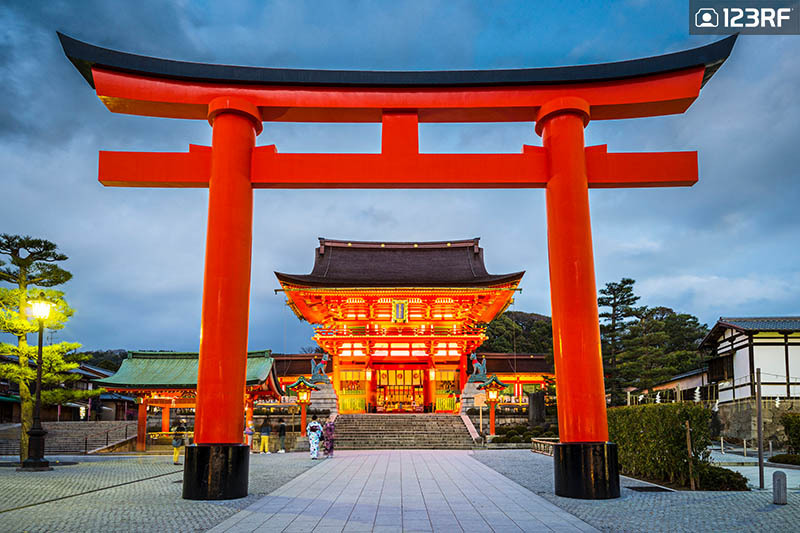 The Fushimi Inari – Taisha is the best and most important building in Kyoto. Situated at the base of a mountain, the endless chili red torii gates guides travelers into a world of its own, deep into the heart of the woodlands. The city’s grand architecture is also visible in the iconic Kinkaku-ji. This ‘Golden Pavilion’ simmers under the sunlight and is bound to attract travelers from far and wide. For something a little different, head to Gion. Origin of Kyoto’s popular geisha district dates back to the days of tea houses. Today, a stroll late in the evening is a great way to explore another aspect of this fascinating city. Additionally, Japan’s fierce spiritual force is also seen in the celestial Okunoin. Built in the memory of Kobo Daishi, the massive Buddhist cemetery is set deep into the heart of the sacred Mount Koya. Here, over 200 000 graves of Buddhist monks are said to await resurrection from Maitreya Buddha. If the sheer history and significance fails to entice you, then the setting would. Rays of light pierce through the canopy and onto the many graves, vines intertwine like an eternal love story and incense perfumes the entire woods. Thus, if you’ve ever wondered what heaven looks like, you’ve come to the right place. The lost city of Petra continues to hold secrets of the ancient world in the Jordanian desert. Image via Andrei Olov@123RF. Jordan does not do ordinary. This spectacular country has often been overlooked due to safety concerns over its neighbors. But it’s now time for Jordan to step up and stake its claim as one of the world’s most decorated nations. 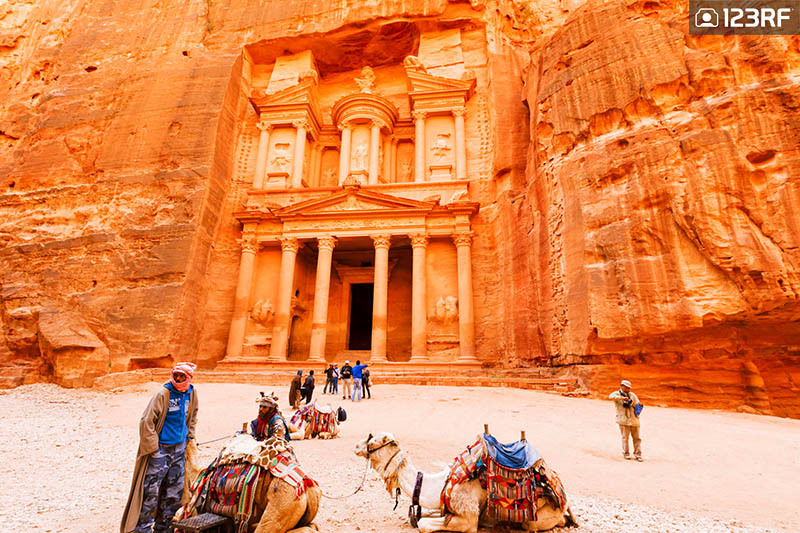 For the 123RF World Travel Guide, Petra is at the heart of Jordan’s allure. This ‘Rose City’ is carved of blushing pink sandstone, high in the cliffs and peaks of the desert. Voted as one of the New Seven Wonders of the World, this ancient city was the capital of the Nabataean Kingdom. The Siq, a narrow pathway leading through red-rock walls, oozes with an Indiana Jones like charm. Meanwhile, the Al – Khazneh is one of the most elaborate buildings in Petra. Legend has it, pirates have used this as their treasure chest. Therefore, giving rise to its second name, the Treasury. Next, Jordan’s charm takes us to the Roman ruins of Jerash. The ceremonial gates, temples and theaters pay homage to the glorious times of this country. Finally, no trip here is complete without a visit to the Wadi Rum. The red Al Hasany dunes and Khazali Siq are the highlights of this golden stretch of land. Treat your eyes to majestic views of the Tien Shan mountains. For the 123RF World Travel Guide, Kazakhstan is like waffles and fried chicken. Like the perfect blend of sweet and savory, Kazakhstan combines the best of Europe and Asia along with the ancient and modern. The city of Almaty bears testament to this. Almaty is home to a series of luxurious apartments, swanky malls and modern museums. The Kazakhstan Museum of Arts accommodates the finest local, Russian and Western art and handicrafts. Meanwhile, the colorful Zenkov Cathedral oozes with the air and charm of Prague or Budapest. However, for the best views, you’ll have to head outside. The Aksu – Zhabagly Nature Reserve is a massive wilderness that’s bound to leave you in awe. Green valleys, rapid rivers, snow capped peaks and the elusive snow leopard make this a must visit. Additionally, Kazakhstan’s raw beauty is also seen in the gorgeous Kolsai Lakes National Park. 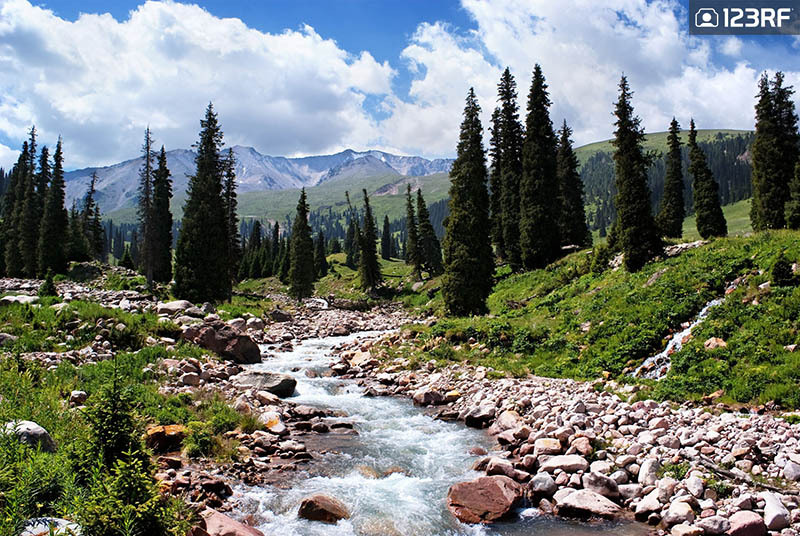 The ‘Pearls of Tien Shan’, offer travelers a chance to hike with breathtaking views while devouring mouthfuls of wild berries. 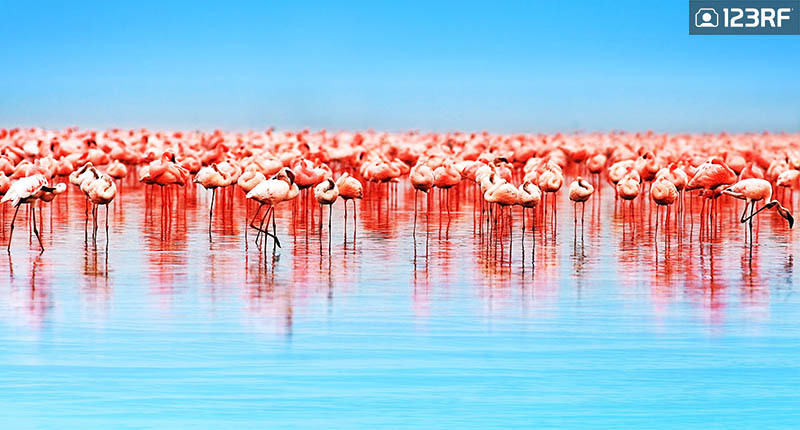 Kenya’s fantastic wildlife is on display at Lake Nakuru. Kenya is a step into the wild. And the Masai Mara perfectly embodies this. The game reserve of this sprawling patch of land is the pick of the bunch here. Just be sure to catch the incredible wildebeest migration for an experience of a lifetime. However, Masai Mara’s allure is not just confined to the park. The communities and successful conservation projects in this area only adds to the irresistible charm of Kenya’s poster child. Additionally, for a unique getaway, the 123RF World Travel Guide recommends the Lamu Archipelago. Back then, the Arabs called them the ‘Seven Isles of Eryaya’. Now though, countless tourists have fallen victim to the beauty of these islands. The Lamu town and the Shela beach are most popular attractions here. So if you’re looking for a place to lay back for a while, this is it. Kenya’s diversity also takes us to Nairobi. The capital city is more of a concrete jungle, but this is Kenya. Therefore, another national park is right at the doorstep of Nairobi. But we’re here for the city’s beating heart, best experienced on its streets. So grab a good pair of loafers and take a stroll into one of Nairobi’s exciting line-up of restaurants, museums and nightclubs. A traditional house in Fanning Island. Image via Carmengabriela@123RF. Ever dreamed of visiting Paris and London in the same proximity? 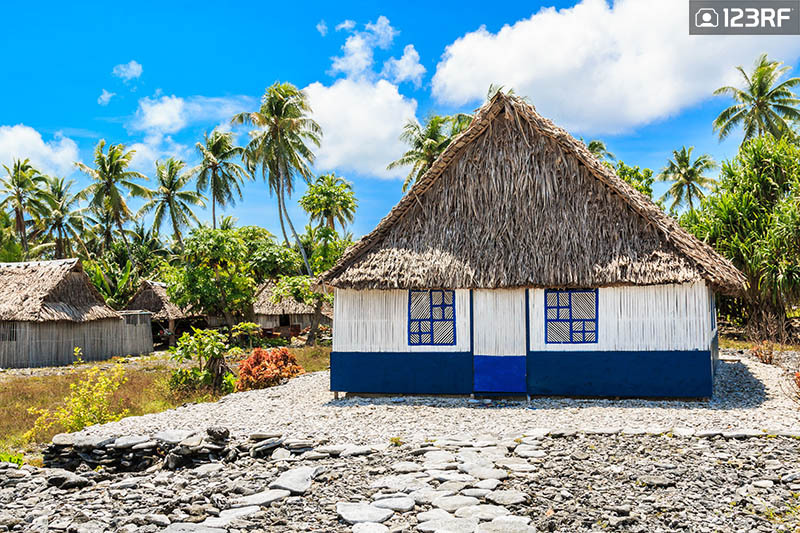 Well the 123RF World Travel Guide uncovers your dream in Kiribati. This tiny island nation in the middle of the Pacific ocean is in danger of being submerged due to the rising sea level. Therefore, paying a visit to this easily overlooked destination is now extremely important. Life in Kiribati is relaxing. With a population of just over 100 000, this is an intrepid nature lover’s paradise. Fishing, bird-watching, diving and surfing are the best activities of the island. For anglers, head to Christmas Island. The waters here are stocked with an abundance of marlin, sailfish and tuna. However, the prized catch here is the giant trevally and bonefish. Meanwhile, the Phoenix Island marine protected areas are great for a taste of Kiribati’s rich underwater life. Additionally, the World War Two has also scared Kiribati’s land. The Tarawa and Banada Islands offer travelers the chance to explore shipwrecks, bunkers, tanks and artillery weapons scattered on land and sea. If all that does not entice you, then simply opt to ride the waves during the day and lay in your hammock in the evenings. 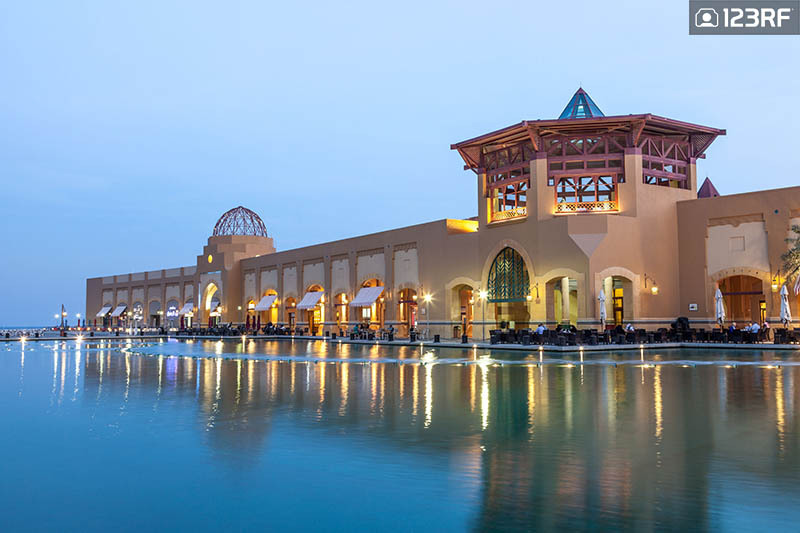 Have a cuppa and enjoy beautiful views at the Al-kout Mall. Kuwait is unlike other Gulf nations. It squares up when it comes to oil wealth, but that’s as far as the similarities goes. For the 123RF World Travel Guide, Kuwait has a more authentic Arabian feel, as it has somehow escaped the grandeur of its neighbors. The heartbeat of this country lies in Kuwait City. For the ultimate experience, head straight for its Souq Al – Mubarakiya. It’s easy to spend hours wandering away in this massive market. For those looking for home decor inspiration, buy one of the Persian silk carpets and Arab antiques on sale. As for fashion enthusiasts, check out the traditional costumes, jewelry and fantastic ouds and musks. For foodies, feast on the rows of stalls selling anything from fresh fruit to dates and honey. Next, for a step back into Kuwait’s past, travel to the Tareq Rajab Museum. Located in a massive villa, this elegant museum homes exquisite ceramics, jewelry and stones. Important Islamic manuscripts and calligraphy collected over the past 250 years, are also on display here. Finally, no trip to Kuwait is complete without the famed Kuwait Towers. For the best experience, dine at the Horizon restaurant and take in the stunning views from the nation’s symbol of economic resurgence. Next up on our 123RF World Travel Guide, join us as we explore the best unspoilt mountainscapes of Central Asia in Kyrgyzstan and uncover a labyrinth of Roman and Greek ruins in Libya. Also, catch up on our previous 123RF World Travel Guide series which witnessed a celebration of colors in India’s simmering Golden Temple to Italy’s rainbow hills of Cinque Terre. Finally, be sure to read up on more travel stories to satisfy your wanderlust cravings. Also, do check out more of 123RF to help design your story for your blog, magazine or website.